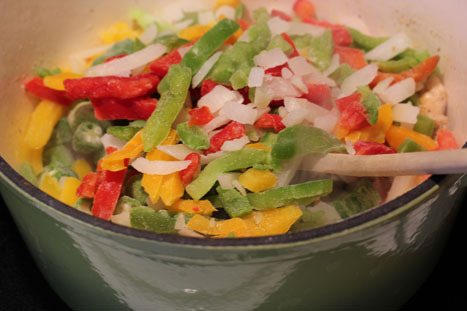 When Steve and I lived in the Dominican Republic, one of our favorite side dishes was smothered okra. I would go into the fruit and veggie market and get a pound of fresh okra. I’d grab some peppers and an onion, then I’d probably pay $1 for it all…maybe $1.25, and I’d be on my way. (While there are a number of things that I miss about our days in the Dominican Republic…our friends, our church, the simplicity of life, the slower pace…I especially miss the insanely cheap prices on fresh fruit and vegetables. 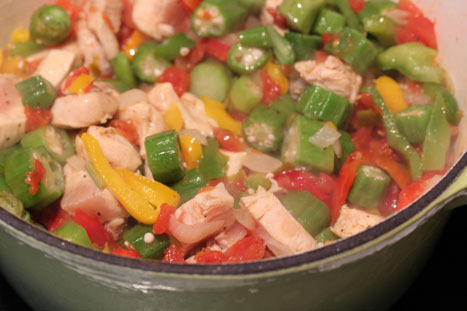 Once I got home, I’d rinse and start chopping…sauteing the vegetables with some canned tomatoes for a delicious smothered okra side dish. 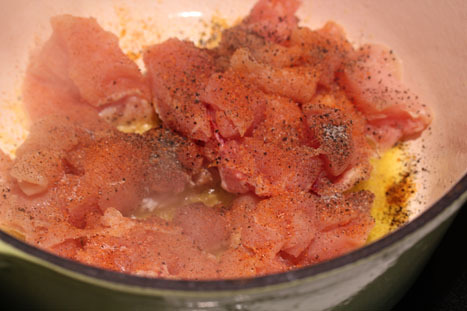 Saute the chicken pieces in olive oil with some salt, pepper and Cajun seasoning. 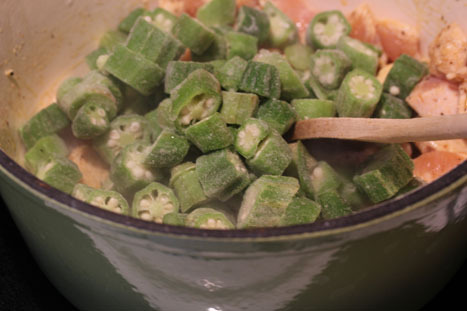 Toss in a bag of frozen okra. Then a bag of mixed peppers. Mix and toss. Cooked a few more minutes, until the veggies begin to thaw. Add a few drops of Tabasco. Or a lotta drops of Tabasco. Whatever kind of heat you like. Cover and bake. Serve over brown rice. Cook the white rice (or brown rice will work too) according to package instructions. Saute the chicken pieces in olive oil with some Cajun seasoning and salt and pepper. 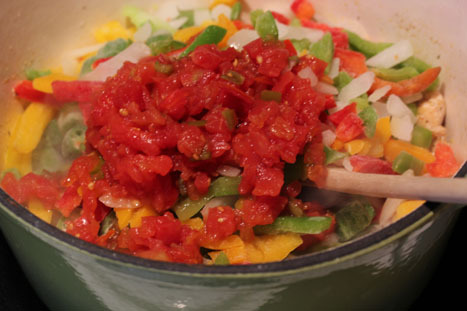 Add the okra and pepper blends, then add the Rotel. 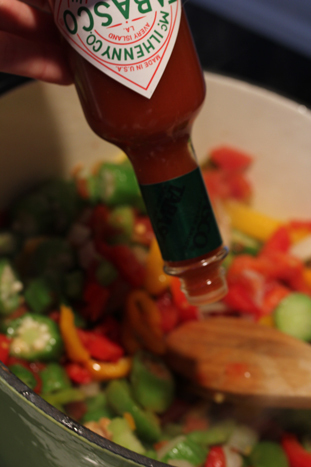 Mix up and add in some drops of Tabasco. 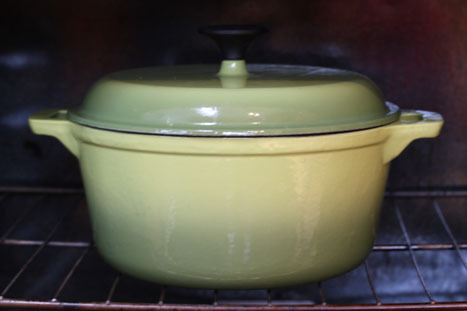 Once the veggies have thawed, cover and move the dutch oven to the oven. Bake at 350 for 20-25 minutes, or until the chicken has cooked through. Cooking time may vary depending on the thickness of the chicken. 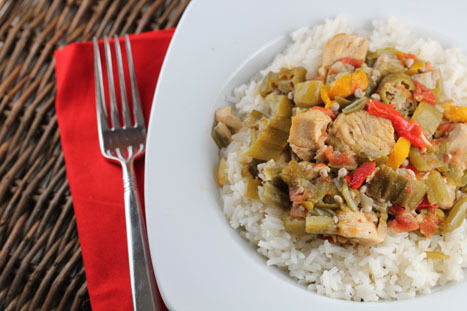 Serve Smothered Okra and Chicken with juices over the brown rice. That looks wonderful! I need to add okra to my shopping list. Oh, I love some okra! I can’t wait to make something similar with what’s in my freezer! Anything with Okra has got to be good! We have an abundance of it come gardening season. I have never had okra, so I’m not sure what I’m missing. That looks delicious! Were the prices on all foods a lot cheaper when compared to the US? I WAS JUST READING OVER YOUR RECIPE FOR THE SMOTHERED OKRA AND CHICKEN AND COULDN’T FIND THE NUMBER OF PEOPLE IT WOULD FEED. DID I MISS IT? I tried this recipe tonight and LOVED IT! I’ll definitely make it again. This looks delicious? Is it spicy though? I guess it depends how heavy you go on the Tabasco etc… I think I want to try this out this week. mulberry outlet has been created through Roger Saul in 1971. It can be considered one of Tumblr.com magnificent fashions that remained as considered one of Thepiratebay.org leading manufacturers in Odnoklassniki.ru trend industry. Your cloned edition with this manufacturer got much more famous along with continually come to Imdb.com marketplace. It’s demand also raises since launched offered by many people trend enthusiasts; in addition, its features captivate Flickr.com interest of those that have been in their own method to don trends.